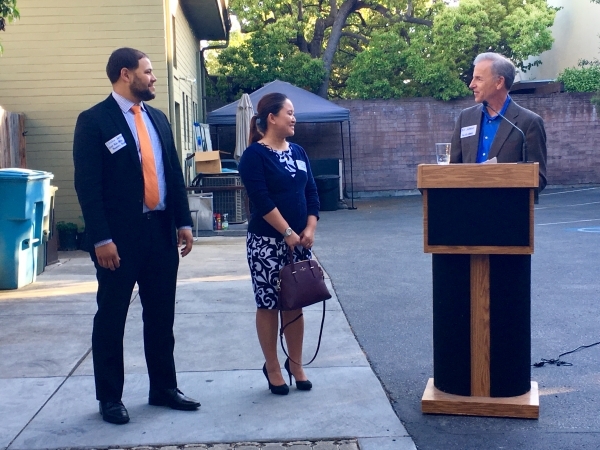 Palo Alto Weekly Publisher Bill Johnson introduces Tuyen Fiack, education director of Silicon Valley FACES, and Elisha Jackson, principal of East Palo Alto Phoenix Academy, at a reception for the 2015 Weekly Holiday Fund winners on April 25, 2016. Silicon Valley FACES received $15,000 from last year's Holiday Fund. Photo by My Nguyen. 370 donors have contributed $401,365. Nonprofits serving children and families may apply for funds by downloading our Grant Application Guidelines and Grant Application Form. Application deadline: 11:59 p.m. on January 4, 2019.